Winner of Visit Scotland's Thistle Award for 'The Best Accommodation Provider' in Central, Tayside and Fife 2016/17, the cottages are situated within a privately owned estate and has spectacular loch and mountain views across Glen Dochart. The setting is magnificent with a true highland landscape all around and is often complimented for the abundance of bird and wild life that can be seen. It is not unusual to see the deer meandering off the hill and passing nearby the cottage and its garden. The Portnellan Estate has been privately owned by the same family for well over 30 years and offers fantastic facilities including fresh run salmon and trout fishing on the estate lochs and river, mountain bikes with plenty of trails on and off road for all abilities, Canadian canoes, kayaks and rowing boats on the river and loch. Clay pigeon shooting can also be arranged. Centrally located in the Trossachs, it is the perfect base for exploring Central/West Scotland with known landmarks only a short distance away. Oban is just 45 minutes, Stirling, Fort William and Glasgow just over an hour and Edinburgh one and a half hours drive. Glen Coe and all it beholds is less than 40 mins drive and the bonnie shores of Loch Lomond are 20 mins by car. Other areas include the truly beautiful Glen Lyon and Loch Tay, Glen Etive, Glen Lochay and Glen Orchy all within the local area. 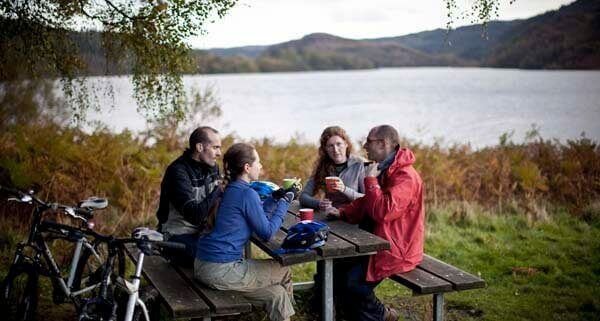 Whether you are looking for the adrenaline rush of adventure or lazy days on your doorstep, out and about on the many hills in the local area or exploring one of the most beautiful parts of Scotland, Portnellan Estate offers you the warmest of welcomes upon your return. Capercaillie Cottage is a bright and roomy modern cottage that looks out over private gardens across Loch Dochart to the castle ruin on the island and pleasant walks along the old dismantled railway line. The cottage can be made available on its own sleeping comfortably up to 8 people. Capercaillie is semi detached to Stob Binnein Cottage. 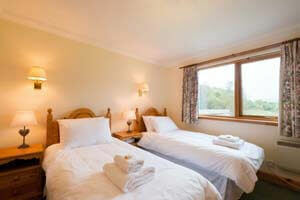 Both cottages boast identical living and sleeping configurations. 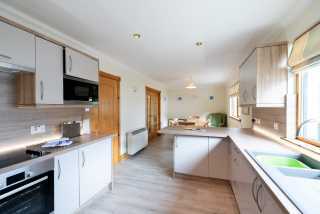 The cottages offer the facility of being made available for larger groups of up to 16 with the added benefit of two living, dining and kitchen areas. Comprising of 4 spacious bedrooms, 3 of which are double located upstairs and a twin bedroom with ensuite facilities designed with a walk in wet room located downstairs. It is the perfect property should anyone in your group prefer reaching their sleeping quarters without stairs. 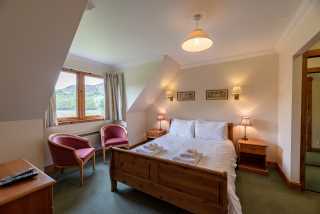 Treats include soft Egyptian cotton bed linen, soft white fluffy towels and toiletries. 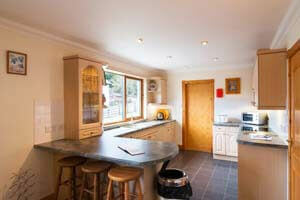 With a spacious open plan kitchen with large breakfast bar leading to a dining area. French doors lead to a large living area with wrap around leather suite and an entertainment system with 37 inch LCD TV with SKY TV package, Blu Ray DVD and WiFi. A sliding, double glazed patio door leads on to a private patio with garden furniture, BBQ (available to hire) and unrestricted views. 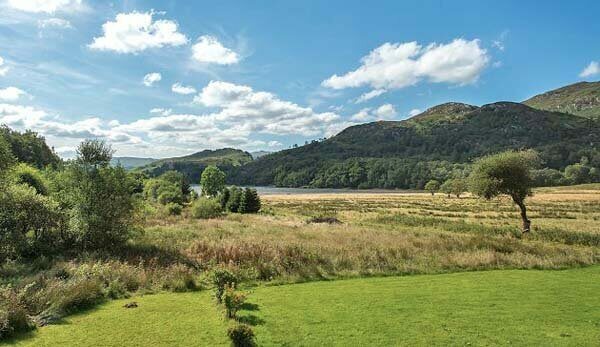 Step out onto your large private patio on a bright morning, and the view across Loch Dochart to the steep glenside will take your breath away. Then look on the other direction and the view of Ben More will stop you in your tracks again! By Car: From Glasgow: Follow signs for A82. Continue over the Erskine Bridge towards Loch Lomond and follow signs to Crianlarich. Turn right at Tarbet. Continue to Crianlarich. Turn right at the roundabout towards the village of Crianlarich. At the hotel junction turn right onto the A85 towards Stirling. 3kms outside of the village you will find Portnellan on the right hand side. By Rail: Trains run along the West Highland line from Glasgow to Crianlarich each day. The Caledonian Sleeper (known to most as the Hogwarts Express) operates overnight every day except Saturday night from London Euston direct to Crianlarich. Heating is included for all 2 nights stays. Longer stays receive the first £20.00 complimentary and the remainder is settled upon departure. Bed lien, towels, tea towels and bath mats are all provided. Weber gas BBQ and mountain bikes available to hire. Flexible change of day. Check in from 3pm and checkout 10am. These times are flexible by prior arrangement. 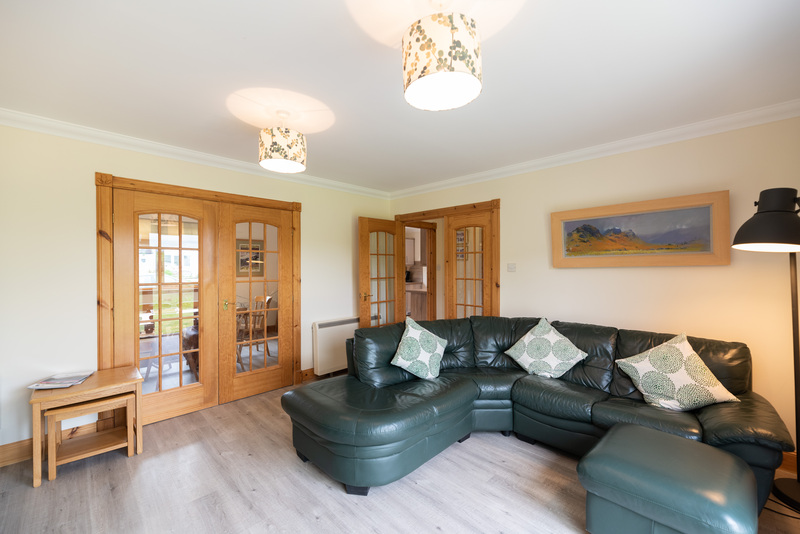 To book either or both of these holiday homes in the Trossachs, click the enquiry button below and see availability and rental prices. 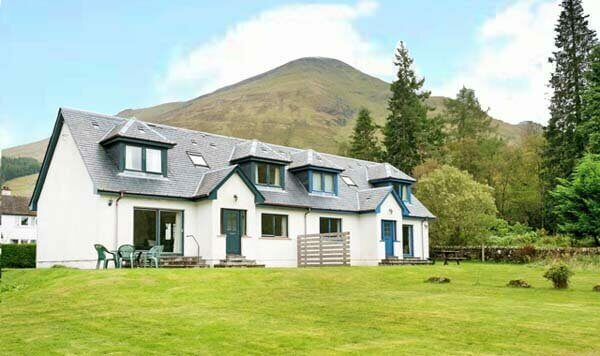 These cottages near Crianlarich are ideal for family holidays or a group get-together in a stunning part of Scotland. There are many outdoor pursuits on the doorstep and a warm and comfortable holiday house to return to.